I’m a self-confessed coconut oil addict. I use it for everything from removing makeup, moisturising my skin, conditioning my hair, as a cuticle oil, as a lip balm, a daily cleanser, and to soothe redness. My friends joke that I even put it on my car, my relationship, all over my house, pets.. you get the idea! 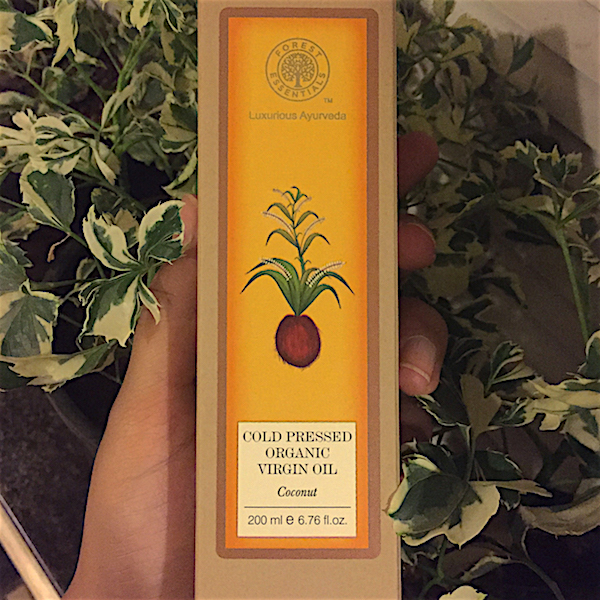 I’ve tried many brands of coconut oil, all cold-pressed but varying in quality, until I tried Forest Essentials Organic Cold Pressed Virgin Coconut Oil and fell in love at first touch. You can tell it’s totally natural just from the smell, which is like delicate fresh green coconuts, not that musty oil smell you get from cheaper versions. The consistency is nice and thick, and a small amount goes a long way when rubbed between warm hands. It melts into your pores deliciously, giving the skin all those amazing benefits of moisture, nutrition, and deep cleaning. Coconut oil is anti-fungal, anti-bacterial & anti-viral, meaning it really does get rid of all that grime on your face. Not to forget, it makes skin & hair so soft that you basically won’t able to stop touching it (but please don’t, excess touching of your face spreads bacteria and causes acne, and too much playing with your hair makes it frizz). Forest Essentials uses the old fashioned method of extracting oil, by cold-pressing dried coconuts. Cold pressing is a technique used to extract oil that doesn’t damage any of the essential fatty acids and nutrition, so you get a product with all those wonderful nutrients our skin & hair needs. It’s amazing when eaten as well, and has numerous health benefits. The best way to use this product is to warm slightly in a small bowl placed over hot water (never over direct heat as this destroys a lot of the good stuff) and then massage into your scalp, the length of your hair, face, neck, body and even nails. Leave it on for as much time as possible and then shower it off, taking care to not over dry the skin by using harsh soaps & chemicals. A mild body wash or soap and a loofah does the job perfectly. I use coconut oil as a nighttime moisturiser a few times a week, spreading a thin layer on my face & neck before going to bed. Similarly, for deep conditioning of dry feet, apply a thick layer of warm oil on feet and put on a pair of socks. Let it soak overnight. Any areas of the body that need extra love & care can be slathered with this yummy oil, just try to not eat yourself because you’ll smell like vegan cookies. At Rs.750 for 200 ml, this version is slightly more expensive than others in the market, but one bottle lasts me more than 6 months if taken care of properly and the high quality is worth paying for when it comes to skincare. Remember to store it in a cool, dry place and keep water away. If you do get any water into the oil, it will go bad within a few days. The way to tell is the smell, it will no longer smell fresh and delicate, but stale & musty. Sometimes a brownish sort of substance starts forming at the base of the bottle, which means its time to throw it out. There are other good cold-pressed coconut oils available too, but do your research and make sure you’re not getting a subpar, impure product. The benefits of the modest coconut and its miraculous oil are endless, and when used regularly over a period of a few months, it will transform the health of your skin and hair; giving it glow, shine & protection.